Udayan Care is a Public Charitable Trust, working for the last 14 years, for the quality care of disadvantaged children and women. The vision is to 'Regenerate the rhythm of life of the disadvantaged'. With the active participation of Sanjay Gupta and Anurag Gupta from American Express, and their team of volunteers, such as Archana Bhatia (HR) and Atul Kapoor (Finance) as well as volunteers from their process management team, we are all geared up to improvise best practices as well as evolve a manual of policies and procedures for consolidation and expa nsion of our programmes. Our Policy on Child Protection got finalised with the help of a German volunteer, Ms. Melanie Effenburger. Almost 3 months were spent on this very participatory process with all the stakeholders, mentor parents, the professional staff, caregivers, volunteers and children. We participated in various consultations, including the one organized by Prayas on J.J.Rules, and QIC&AC. Udayan Shalini Fellowships Programme is now geared up for launching the chapters in Aurangabad, Maharashtra, and Dehradoon, Uttaranchal. Now we have over 64 children affected with HIV/AIDS in our fold. Indian Oil Corporation and Mr. Seth Call also joined in to support our Udayan Outreach Programme with the existing donors like Kidstuf Promos & Events and some individuals. Our Uttam Nagar Computer Training and Learning Center was shifted to Greater Noida. The strength at our 5 centers grew up to 3052. Kristen Benson, our international volunteer coordinator from Australia, is back at our New Delhi Office and is bringing additional advantages to the Program. Melanie Effenburger from Germany helped develop training programs for our newly instated Child Protection Policy and Niti (USA) and Kachina trained the girls in Sant Nagar Home. Julien Lesenechal and Antoine from France finished their voluntary assignment at the Gurgaon home after 5 months, and left behind a beautiful, artistic impression on the walls of newly painted home. Martin Hoenel and Phillip Wolf from Germany began working full time in the office after spending last 6 months in the Noida boys home. Debbie from UK began focusing on English speaking lessons with the very eager group of boys at Gurgaon Home. Twelve students from several reputed Indian colleges and universities have successfully completed their internships with Udayan Care. We extend our thanks to Indian Institute of Foreign Trade, Tata Institute of Social Sciences, Symbiosis Institute of Media & Communication and Jaypee Business School, Noida for sending their students to our organization for summer training/ internship. We wish to have a long-term association with these institutions. The Credibility Alliance conducted an audit for our organization wherein the designated assessor checked all the documents and made a visit to our Homes at NOIDA and Greater Noida. He took away a very positive impression of our organization. Dr. Kiran Modi, our Managing Trustee was presented with a bursary to attend an International Conference on Fundraising at San Diego, USA. Dr. Modi made an inspiring presentation at Princeton University that was attended by professors from different faculties, students and our already signed up international volunteers. Mr. Ricky Surie, our long time donor and friend organized this event and another with the elite gathering of Mc Kinsey Development Group where some very interesting suggestions came up. Another opportunity came when, Mr. Suresh Neotia, our member and long time donor, invited a few important people of Kolkata at his residence on 12th April and presented Udayan Care with a very appealing speech. Dr. Kiran Modi's presentation of Udayan Care's work was truly appreciated. Our Convenor, Kolkata Chapter, Ms Kusum Bhandari's emotional appeal also had a great impact. Children from all 6 homes contributed to the event by making beautiful paintings under the skillful guidance of Ms. Mithu Sen, the famous artist. They also took part in the film being developed on the organization, which was to be shown during the exhibition. The Metropolitan Hotel, New Delhi launched Udayan Care as the hotel's charity of choice in an exclusive luncheon on the 25th of March 2007. The lunch was hosted by Metropolitan Hotel where Udayan Care's friends and life long volunteers participated. The interactive event also helped Udayan Care promote its impending art-show Continuum-a cycle of life. The Metropolitan hotel has very kindly decided to dedicate rent of one of their Suites to Udayan Care. Signing Ontwo or three dimensional- paintings or drawings or sculptures or new media- digital, installation or other forms of art. The objective of the show was to raise funds for our ninth home, which is being constructed in Modinagar; U.P. With some artists donating full amount to some half of the sale proceeds from their works for the cause, the event proved to be a celebrity event with Chitrangda Singh endorsing the cause of Udayan Care with her presence. The corporate society too contributed to this creative art project and helped raise funds for the cause. Perfect Relations took up their job of creating awareness about Udayan Care and the exhibition so perfectly!!! Vatica Group as usual supported whole-heartedly. We are truly thankful to all the others like Coca Cola and Professional Couriers for encouraging us by partnering with us in the event. The beautiful invites and the catalogues, so masterfully printed by Ajanta Offset Printing Press, were appreciated hugely by one and all. Meenu and Meetu of ROOTs fame put in their dazzling event management skill and the audience had a taste of soulful Sufi music and modern dance. The young and lively painter, Sakshi Nayar compered the event. The final countdown began in the month of March as results of final exams started coming out. We had a reason to celebrate as we achieved 98% success this year. Practice SessionThose children who appeared for their Board exams of Class X and XII are still awaiting their results. 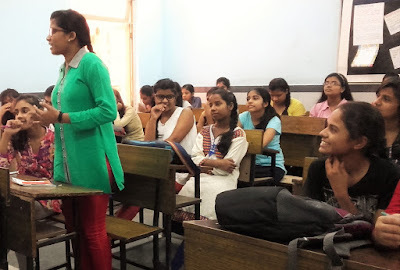 Workshop on Counseling Skills, being conducted by Dr. Deepak Gupta and Ms. Priyanka Goenka continued for our Mentor Mothers, Caregivers as well as the Program Coordinators. Delegates from the British High Commission, including Ms. Wendy Butler, Chairman, Charity Committee and the wife of Deputy High Commissioner paid a visit to the home and made a magnanimous donation of draperies and linen, clothes, suitcases, cushions and what not. Kiran Udayan, awaiting her Class XII result, succeeded in getting a summer job at Mc Donalds’, Greater Noida. CWC Members visited our Home on the 8th of March. American Express gifted movie coupons to our children at Mehrauli Home, which they made use of on the 2nd of March to watch Jodha Akbar at PVR, Saket. An Award Function was organized at Uppal’s Orchid on the 15th of March by HDFC Bank, for their employees. A few children from our Mehrauli Home, accompanied by our Managing Trustee, Dr. Kiran Modi, were invited to the function where the children were treated with snacks and given a bagful of stationeries. HDFC Bank also so graciously donated a cheque of Rs 1,00,000/-. Children looked forward to the volunteers from Google to do various activities with!!! Pinki Biswas and Ruchi Mahajan too succeeded in getting summer jobs for themselves. Pinki has started working as a Front Office Executive at M.P.S. Technologies Limited while Ruchi is working at Mc Donalds, Greater Noida. We hope they have a great experience working there and learn a lot! Fidelity invited our boys to play Holi and have lunch with them. All our boys had a gala time there. Our boys were treated to a practice session between the Delhi Daredevils and the Rajasthan Royals at Ferozeshah Kotla Stadium on Friday 18th April. The children met the Australian cricketer Glenn McGrath and took his autographs while chatting with him. A big THANK YOU to adidas for organizing this event for our boys. A group of 10 corporate volunteers from GE India spent an afternoon at the Guragon boy’s home on Saturday the 19th April. The day was jam packed with games and competitions and prizes were distributed later. 24th of March proved to be a memorable day for our 9 boys of the Yaakov’s Light Udayan Ghar, as they received admission in Rockwood School. We received the much-awaited license to run a second Home in partnership with Yaakov's Light and Home of Hope, at Noida, this time for our girls. Currently, we are in the process of bringing in girls, who hail from U.P., to the home. We await a license for our newest and the eighth home at Pratap Nagar. The architectural designs for the 9th Home at Modinagar U. P. are all ready to start work. Opening one after the another, Fortune is expanding across the length and breadth of our country. The business hotels of Fortune like Kolkata hotels in India, hotels in Gurgaon and Fortune hotels in Chennai are equipped with all modern amenities catering to the requirement of the Business travelers. Your trip to these places would become a pleasure by being at Fortune hotels. The rooms of these hotels are equipped with amenities like 24 hrs room service, inroom tea/coffee maker, Wi-fi connectivity, etc. You would find a range of F& B outlets here. It is great knowing about your organization. I work for similar organization in Bangalore. I think you might like reading www.ngopost.org. Do keep updating your blog. The Royale Park Hotel - Hotels in Noida Delhi - enjoy holidays in cheap hotels of NOIDA/Delhi and make business plan in best guest house of noida, Accommodation in Noida, book serviced apartments noida at very affordable price. Noida is an ultimate blend of modernity and old values.Jaypee is 5 star rated Businesse hotel in Noida which offers perfect hospitality and in-house MICE facilities. With 2430 sq meters of space, it is ideal for business meets. ballroom, meeting rooms, and all tech facilities are there. Hey… I am Surjeet Gupta. I operate a domestic call centre in delhi. One months ago, my office held a meeting with our clients. Our office area in delhi is too small for meeting. So I contact your office space, which provides me meeting room. The meeting room is provided by them is amazing. It is centrally cooled, lots of parking facilities, fire safety and garden area is also there. My client is really impress to see the meeting rooms in noida . Thanks to your office space.